In the summer of 2003, I was working a miserable overnight shift at a large discount retail store. Unlike some stores that stay open 24 hours, the store I worked at closed at 10pm, and because the store was closed, the overnight employees didn’t have to be nice to each other. Employees stocking shelves in stores open for 24 hours are likely encouraged by their employers to be civil to each other, since there are still customers around. But in stores that are closed overnight, employees have the freedom to really be nasty to each other. Mainly employees at the store I worked at treated each other badly. I, a sensitive, semi-disabled person, fell victim to mistreatment practically every shift, and finally decided to quit, after about a month. I remember one night, perhaps it was the night I finally decided to quit, and not go into work anymore, I found myself sitting on a bench on the front porch of the house where I lived with my parents. I don’t cry often, but I was in tears. Besides dealing with depression and so many other issues, I was very sad, because this was the third job I’d had in 2003 that was awful. The first job I’d had that year was at a group home for severely emotionally disturbed boys. I could not handle the stress of working there, and even got sick from the stress, so I quit. Next job I had was delivering newspapers. I started the shift at 2 am, and ended it at about 7 am, though I was supposed to be finishing earlier. I had 83 stops, located in many parts of a fairly large city. I brought papers to stores, and filled those little boxes people put quarters into to buy papers. I could not work fast enough to suit my employers. They were really nice, but I was always the last driver to get in, and felt discouraged about it. Also, 2am-7am is not a good shift to work if one is trying to maintain any sort of a sleep schedule. I quit that job. Some months later, I got the job at the big discount store, and it was terrible, so I quit that one too. I was distraught. I sat outside on a bench on the front porch late at night, and cried. A wonderful thing happened. I saw a very cute young cat walking along the sidewalk toward the house. 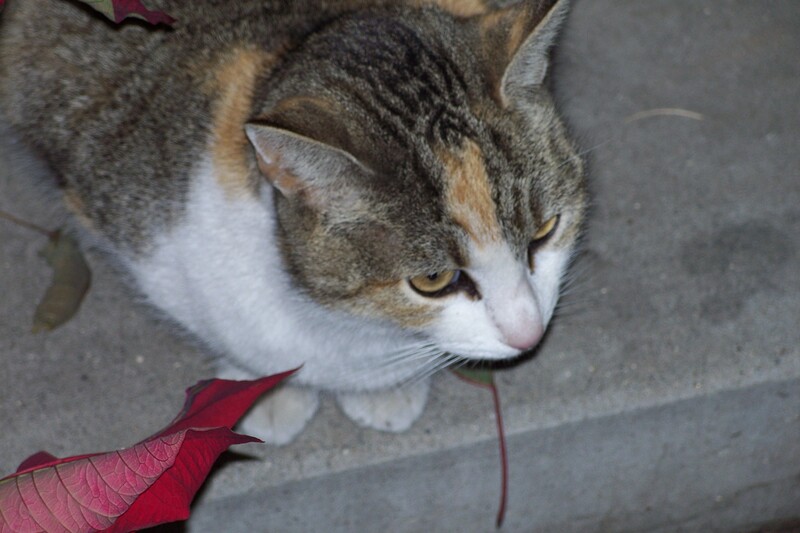 Although there were many cats in the neighborhood, I had never seen this cat before. I thought, “No the cat won’t be friendly, but I’ll try anyway.” I said, “here kitty kitty,” and the little cat immediately ran over to me and hopped on my lap. She sat on my lap for two hours as I pet her and slowly stopped crying. I hoped to keep the cat around, since she had no tags, and since she was obviously a wonderful cat, so I bought some cat food the next day. I wasn’t allowed to have the cat in the house for quite some time, because my mom is allergic to cats. Our neighbors in the other side of the duplex were an old couple, and they also liked the cat. They let her in from time to time. The woman of the house named the cat Suzie. I thought that was a good name. After some years passed, my mom let me have Susie come into my room, and sometime after that, Suzie was given access to the rest of the house. I am guessing mom eventually built up a tolerance to the cat. Suzie was wonderfully friendly, and was with our family for eight years. My parents, my aunt and I moved to Idaho in late 2010. 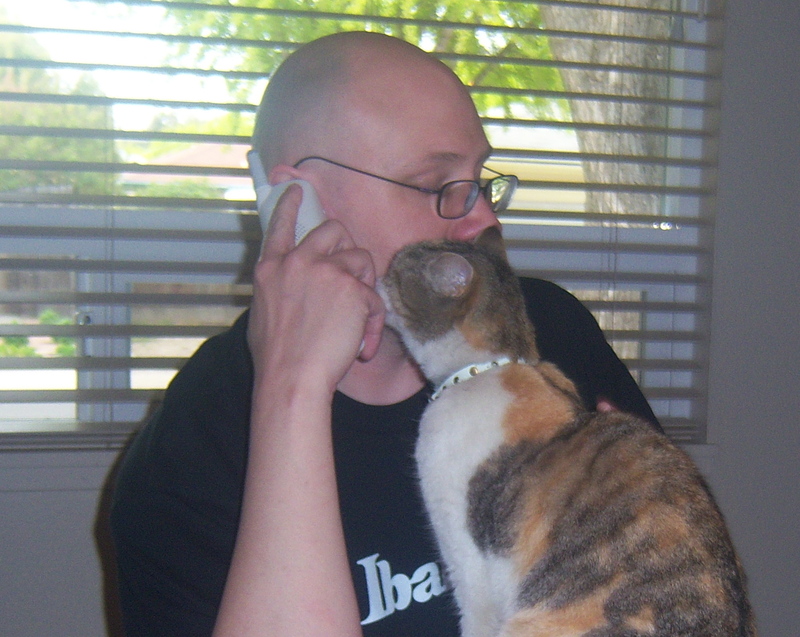 Before we moved, I had the premonition that Suzie would run off once we got settled in Idaho. I thought this because I remembered that when relatives of my sister-in-law moved from one house to another, the cats they took with them left, and did not return. I had a feeling Suzie would do this, and eventually, she did. After moving to Idaho, we lived in a rental home for several months. We needed to do this while we looked for a house to buy. We eventually did find a house, and moved into it in April of 2011. The following month, a rather careless friend of my aunt came to visit us. One night while my aunt’s friend and I were talking, Suzie went over to the front door to try to be let out. We had never let her out before, and she hadn’t much expressed interest in going out. I found it strange she wanted out. The friend of my aunt asked if she could open the door for Suzie, and I said no. The next day, I didn’t see Suzie right away, but didn’t worry about it. The house I live in is fairly large.. over 2000 square feet. I had things to do that day, and didn’t think anything of not seeing Suzie before I left the house. Eventually that day, I made my way to a library, and found a DVD on cat behaviour that I decided to check out. After visiting the library, I returned home, and went to look for Suzie. I could not find her. She was gone. My guess is that my aunt’s friend, who had left before I awoke, had forgotten that I had told her not to let Suzie out of the house, and had let the cat out, or Suzie had sneaked out while a door was left open. I never saw Suzie again. At the time she left, I was dealing with a badly sprained foot, could not walk without a cane, and was not supposed to walk much at all. I was not able to canvass the neighborhood looking for Suzie. I asked my relatives for help, but they would not. Even though this house is large, we could never find a very good place for a cat box. This bothered my mom and aunt. Also, they had started to become a bit annoyed with Suzie. She was still adjusting to the house (moving to a different house unsettles cats), and would roam the halls at night, banging on bedroom doors with her feet, meowing, and sometimes waking people up, or keeping them awake. I would have kept Suzie in my room, and tried to do this, but she did not want to stay in my little room. She would bang on my door repeatedly and make noises to be let out. Also, mom and my aunt were stressed about moving into a new home, sorting through boxes, arranging furniture, etc., and didn’t want a cat underfoot. They didn’t seem to want Suzie back. I could have called the local animal shelters, but because of the attitude of my aunt and mom, and perhaps more because of the premonition I had back in California, I did not call any shelters to see if they found my cat. I finally had the attitude that there was something mystical going on, and that I and the rest of the family had been been blessed with Suzie’s presence for a certain time by whatever powers that be, if there be any. Suzie had shown up on a night when I was very very upset and needed comforting. She disappeared mysteriously, on a day when I happened to check out a DVD on cats at the library, and ran off like I thought she would. I somehow felt that maybe someone else needed her more than I did. I don’t know where she is now, but I hope she is with a family who loves her like we did, and who she loves as well. It was on this same day that my 92 year old grandma, who had been living in a care home nearby, passed away. This might sound harsh, but I was never close with my grandma, she was rather hard to deal with, and I don’t miss her at all. But I still miss Suzie sometimes. The following year, while I was exercising in my room, and had my glasses off, I saw an animal come to my window and scratch on the screen. My room is in the bottom of a tri-level house. The floor of my room is at least 4 feet below ground level. As I am sitting at my desk now, I can look out at part of the backyard, and the windowsill is about level with my chin. It was strange to see this animal. My vision is of course bad without my glasses, and I could not quite tell what kind of animal it was. It is common to see squirrels in the backyard, and I had on one occasion seen a raccoon in the neighborhood late at night, but I was guessing this animal was something else. After my initial startled reaction, I determined that this animal must be a cat. I had missed Suzie a lot, and often hoped she would someday return. The cat moved away from the window before I could get my glasses on. Once I put on my glasses, I hurried to another window, and saw a cat hop over the fence. The cat looked a lot like Suzie. The cat continued to come around, and eventually I got a better look at her. 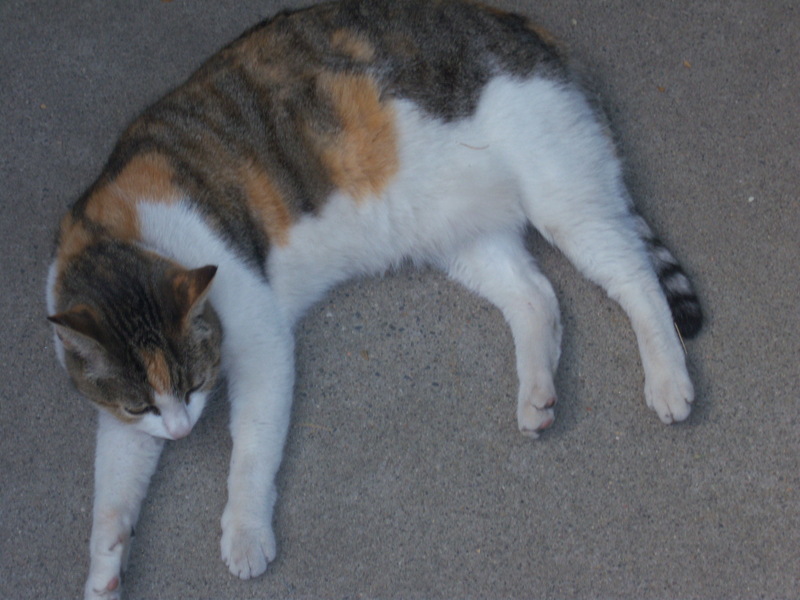 She really did look a lot like Suzie.. pretty much the same unusual combination of fur that is white in parts, and also a mix of calico colors and stripes, with a ringed tail. I have almost never in all my life seen cats with this color scheme. But this cat was not Suzie. 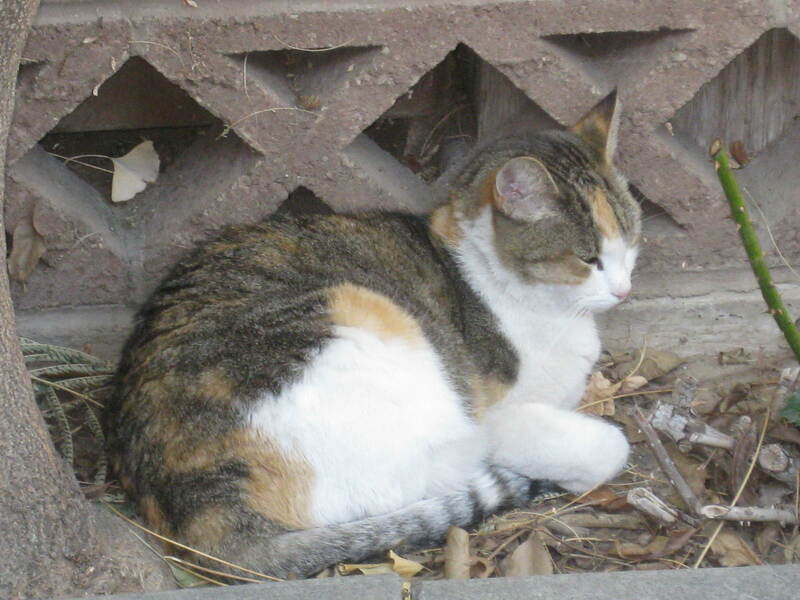 As far as I can tell, this cat turned out to be about the age Susie was when she first showed up, back in California. And, upon close inspection, this cat did not look identical to Suzie.. very close, but not identical. The cat eventually wanted to be let in. She wasn’t as interested in people as Suzie, but did allow herself to be petted. She had a collar and a name tag. Her name is Snickers. I actually don’t know if this cat is female. I knew Suzie was female, because we had her into the vet once. This cat just seems female. Male cats tend to have more of a swagger, seems to me, so I will assume Snickers is female. Snickers still comes around. She likes to climb up the screen door which is mounted next to our sliding glass door that leads to the back yard. She used to climb up the screen door so much that my mom called the number on Snicker’s name tag, to talk this over with the owner. The owner sounded nice, but not exactly helpful, just said that Snickers was mostly an outdoor cat that liked to roam the neighborhood. Snickers doesn’t climb the screen door so much these days, not since my aunt bought a spray bottle which she filled with water, and sprayed the cat when she climbed up on the screen. Mostly, Snickers behaves better now, and just comes to the door. Sometimes she meows, and at other times she just sits and waits. Sometimes we let her in, and sometimes we don’t. Mostly, she likes to snoop through the house. My mom doesn’t want the cat in the upstairs bedrooms, and I don’t want Snickers in my room, because I am concerned she has fleas, so before I let the cat in, I close the bedroom doors. Snickers still likes to roam the house though. Lately, she has been more interested in being petted. She doesn’t stay on our laps for long, but sometimes will hop off, later to return, several times. Also, she lets me pick her up and hold her for awhile. She was just in the house earlier today. 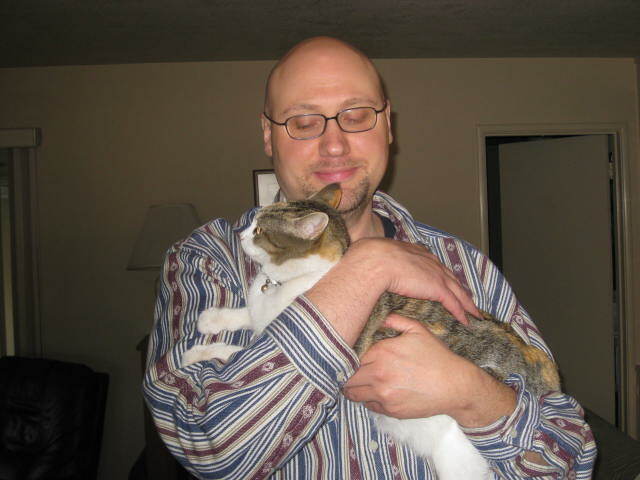 I wasn’t planning on writing this post about Snickers and Suzie, so I haven’t as yet taken any pictures of Snickers. I cannot predict when she will next appear. Sometimes I see her every day, and sometimes I don’t see her for a week. 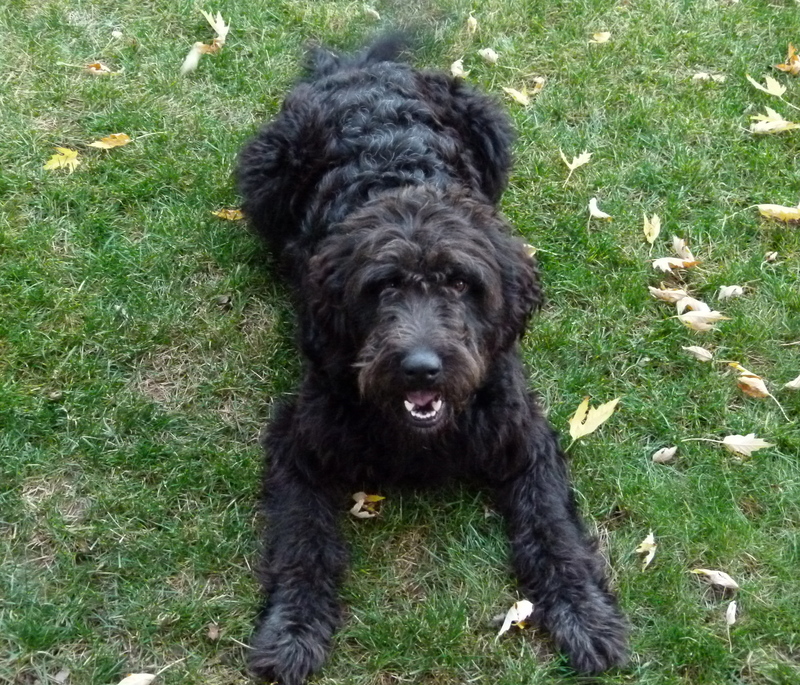 Eventually, I will take a picture of Snickers, and post it here, so you can see how much she looks like Suzie. It is nice to have a cat around again, although it is strange that Snickers looks so much like my cat that disappeared. Current cats: Shadow, Norbert, and Snowball. Shadow is a grey striped cat that is over 15 years old. She is two years older than my brother’s eldest child. Shadow likes to be petted once in awhile, but has never been very social, except that for many years, she made sure to curl up with my oldest nephew when he went to sleep. Norbert is a svelte tomcat with attitude. For some reason he reminds me of a jazz musicians from the ’40’s or ’50’s… a real cool cat. He is also grey striped, but has a more exotic pattern of fur than Shadow does. I think Norbert is 4 years old, but I am not sure. He is the kind of cat that constantly wants to go in and out of the house. He’s been fixed, but still somehow sprays both indoors and out. He likes people, but is often aloof. When he feels like being friendly, he will sit on a person’s lap for a very long time. Snowball is the youngest of the cats. She’s been with the family for less than a year. My youngest nephew (my brother has two boys and a girl) one day decided he wanted a cat, and wanted one that is all white. Solid white cats are rare. I’ve hardly ever seen any. My brother and family went to the local humane society.. and found a little all-white cat. My nephew gave her her name. that is also part of the family. 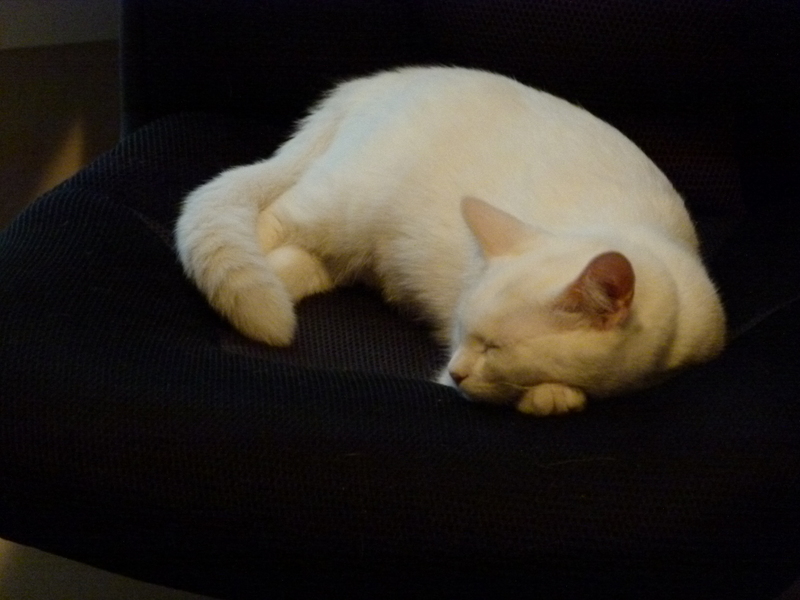 However, unlike Norbert, Snowball will not sit for a long time on anyone’s lap. Still, she’s my favorite cat of the three. Snowball looks a bit odd. Besides being all white, she has a tail that curls when she walks, instead of sticking up like the tails of most cats. Snowball’s tail curls around down her back. Yes, she is an interesting kitty. At around dusk, and sometimes later at night, I’d have Suzie in the house, and she would start to act very strangely. She would look very intently at.. I don’t know what. She would flick her tail and act like she was ready to pounce. After that she would suddenly chase whatever it was she saw that I couldn’t. Sometimes, after a chase, she would act very startled and scared, and quickly run away. She did this a lot. Sometimes she apparently chased small, invisible creatures until she was poking her nose underneath my bed, then she would meow loudly, and run off very fast. Very strange. I’ve not seen my brother’s cats do this often. But, I have seen Snowball chase after invisible creatures at least once. A few evenings ago, I was outside in the backyard raking leaves. Snickers was out there with me the whole time. I started raking about a half hour before the sun started to go down, and was outdoors for over an hour. Snickers started looking at something I could not see. She walked over to some bushes, and stuck her nose in them. Then, like Suzie, Snickers appeared afraid, made an alarming sound, charged back across the yard, and hurriedly climbed up a tree. She relaxed for a little while in the tree, then came back down. After that, she stalked.. I don’t know what.. across various parts of the yard. Sometimes she was on the prowl and sometimes she acted scared and ran away. Sometimes cats chase small insects that are not visible to humans from a distance, but often cats really seem chase things we cannot see even up close. Cats are part of various mystical traditions and superstitions. The most popular animals witches in old stories had were black cats. The ancient Egyptians were fond of cats, and there is even an Egyptian deity called Bastet (also called Bast) that has a cat’s head. I have not done research on the subject of cats and mysticism, but have heard that cats can reportedly see spirits, and gaze into the spirit world. Considering that I am mostly agnostic, I don’t know what to think. Maybe spirits really do exist, and maybe cats can see them. Judging by the behaviour of the cats I have observed, I am guessing the spirits, if they are there, are very short, or tiny, and don’t particularly like being bothered by cats. These spirits scare the cats at times. I wish I could see what cats see.. or maybe not, who knows. But, even though I am not a mystical or very spiritual person, watching these cats makes me think there really are spirits. Cats are truly amazing creatures. I am glad they are still part of my life.